In the past Maoist leaders had vowed not to keep any private property. They handed over their private properties to the party. Now, what will you do to your salary that you will be drawing as prime minister? First, a special committee will be announced to facilitate the integration (of the army) and rehabilitation within six months as part of moves to take the peace process to a logical conclusion. Second, the process of constitution making will be expedited in three months. Third, programmes to provide immediate and long-term relief will be announced. Maybe. 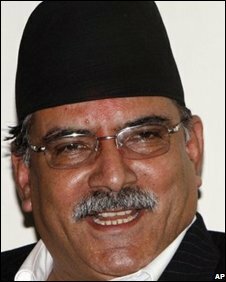 But the people of Nepal have already justified our action - you call it civil war or people's war - through the constituent assembly verdict. Have the people ever justified the palace killings? Let's not get into hypothetical questions. Since China is our neighbor and since we could not attend the inaugural ceremony of the Olympics I went there for the closing ceremony. Anyway, it would not have been easier for me to go there first if there had been no Olympic. I am pained by the allegations that we engage in 'use and throw'. I never think that I have cheated anyone. But in course of advancing my cause, I might have made compromises and come closer to one or another at different times. But there was never any conspiracy there. It was our philosophy of cooperating with others to defeat the primary enemy. There are two schools of thoughts within your party - one favouring the People's Republic and the other favouring the Democratic Republic. Which one will prevail? We will definitely attempt to establish a People's Republic by institutionalizing democratic republic and through the legitimate means like elections. Once we attain that, we will then work to achieve socialism and communism.